At William T Clothiers in Fairfax, we offer tailoring for any type of clothing. This separates us from many other alteration shops in the region because we accept any type of clothing for example custom business suits. Our customers feel comfortable in allowing us to handle there clothing and perform alterations on it. We have a whole team of people at our shop responsible for alterations and ensuring that they go exactly how you planned. In Fairfax, it can be challenging to find a shop that will professionally alter any type of clothing. 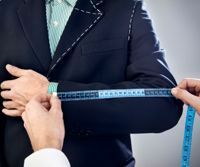 Fortunately, William T Clothiers will do the custom job needed the right way. The alteration department in our Fairfax shop is extravagant and highly recommended by all the locals. We not only do the simple alterations of coat sleeves, waist and pant bottoms. We have the ability to recut a suit. Clients have brought me their better quality suits and had me update the suit. We recut the pants removing the pleats, narrowing pant legs take off the cuff. We trim the coat, take off the arms and cut the shoulders back, shorten the coat length which will give their suit an updated look. We are prepared to assist you with alterations needs as well. Give us a call so we can set up an appointment, receive your garments, and work on them in our shop. PSA! Please respect our staff and our studio by bringing in only clean clothes to have altered. If they are not clean, we won't alter them!